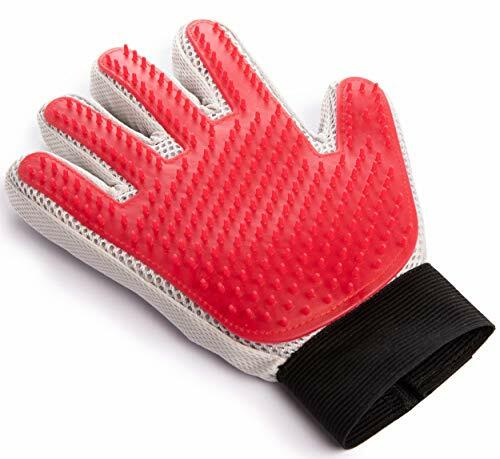 FIVE FINGER DESIGN - Allows you to reach hard-to-reach spots. SOFT SILICONE TIPS - To give your pet a relaxing massage and promote blood circulation. Suitable for small and young pets as well as big ones. DRY GROOMING OR FULL-ON BATHTIME - Can be used dry or with water and soap. Your pet will love bathtime! WORKS ON ALL COATS - Short or long, rough or soft, the long yet flexible silicone tips will make sure no loose fur stays behind. MONEY BACK GUARANTEE - We\'re that sure that you\'ll love the glove. 100% money-back guarantee. Period.